Big business. The Fujitsu Lifebook N532 is supposed to replace desktop computers. With a 17.3-inch display, numerous ports as well as mainstream processor and graphics it meets the requirements. This review shows if the notebook convinces us in every detail. If you want your powerful PC anywhere you go and not waive a large display, the 17.3-inch Fujitsu Lifebook N532 is a good choice. The notebook is an all-rounder that equally suits business customers with its special configuration as well as casual gamers. The Lifebook N532 can be equipped with a variety of different Intel Core-i processors and up to 2 TB mass storage ex works. 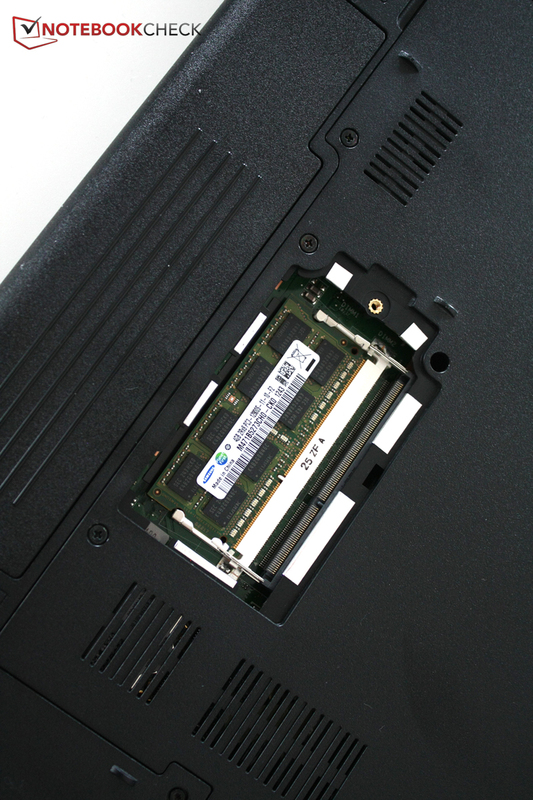 SSDs are also available, even a WWAN module for mobile internet can be installed. 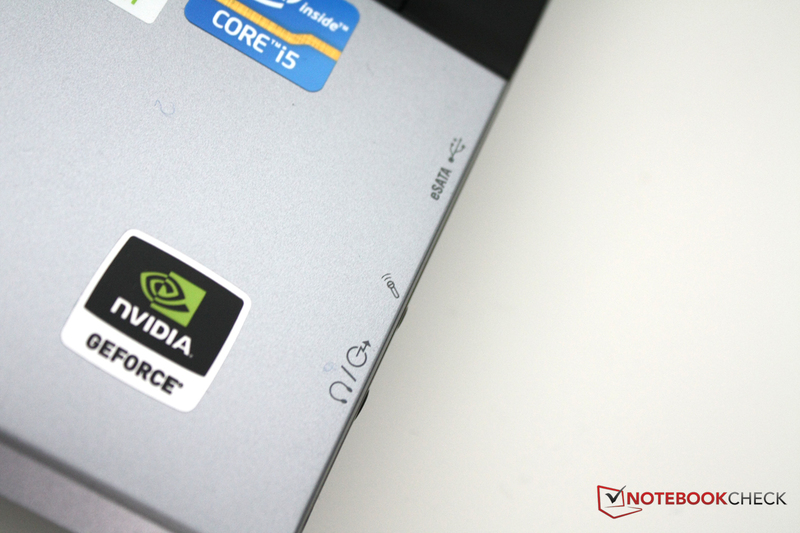 The mainstream graphics Nvidia GeForce GT620M is always on board. Our review unit with the label 0M3501DE features mainstream hardware; it is equipped with the popular Intel Core i5-3210M dual core processor, a 500 GB hard drive and no WWAN module. The Lifebook N532 explicitly wants to be an all-rounder so we compare it with different competitors in its class: The Asus K75VJ offers faster core components for a similar price but lacks any business features. 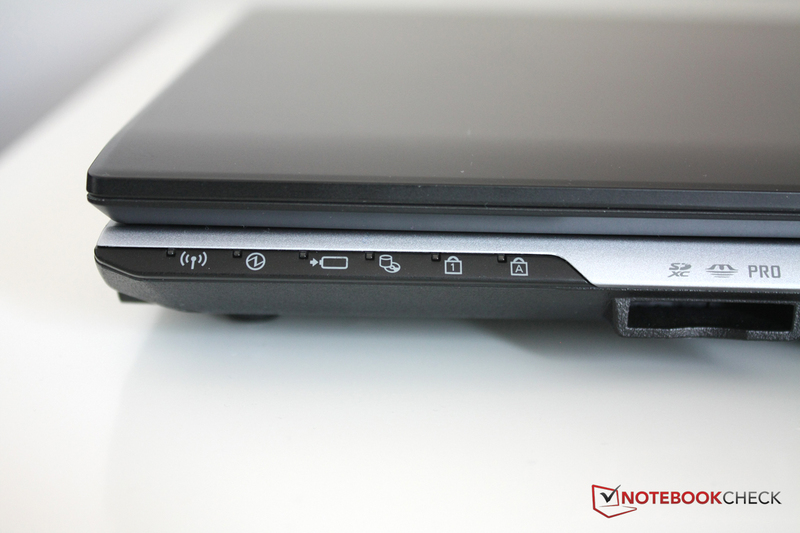 The HP Envy dv7-7202eg also has faster internals and basic protection via fingerprint reader. 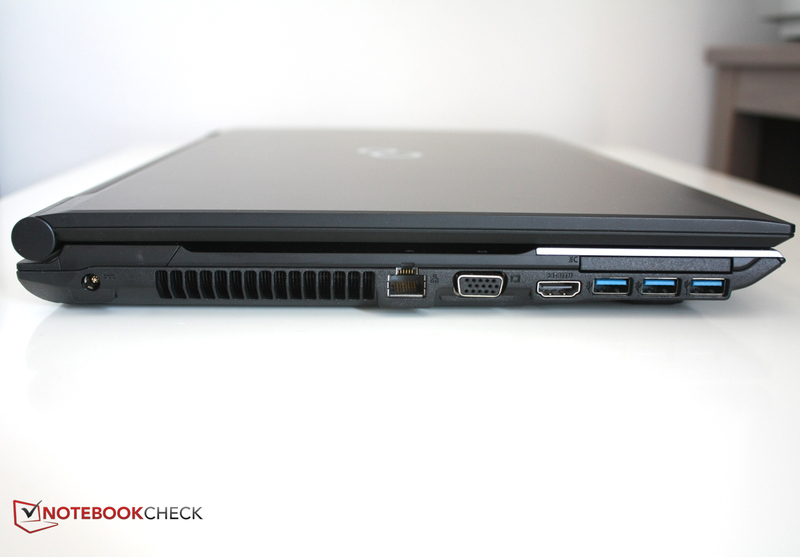 The HP ProBook 4740s has one too. If you are interested in more performance you should have a closer look at the Lenovo IdeaPad Y500, which is more gamer oriented. 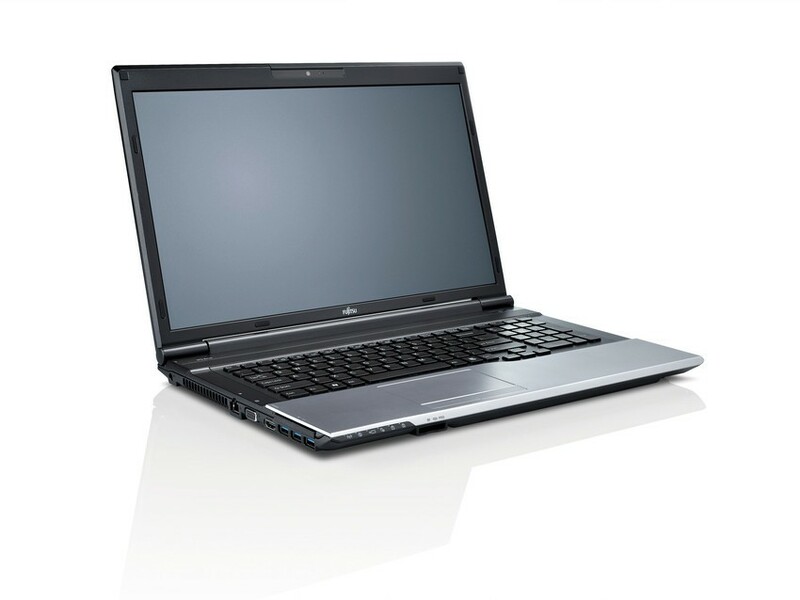 We also have an AMD based competitor with the Toshiba Satellite L875D-10E. Do you like plastic? 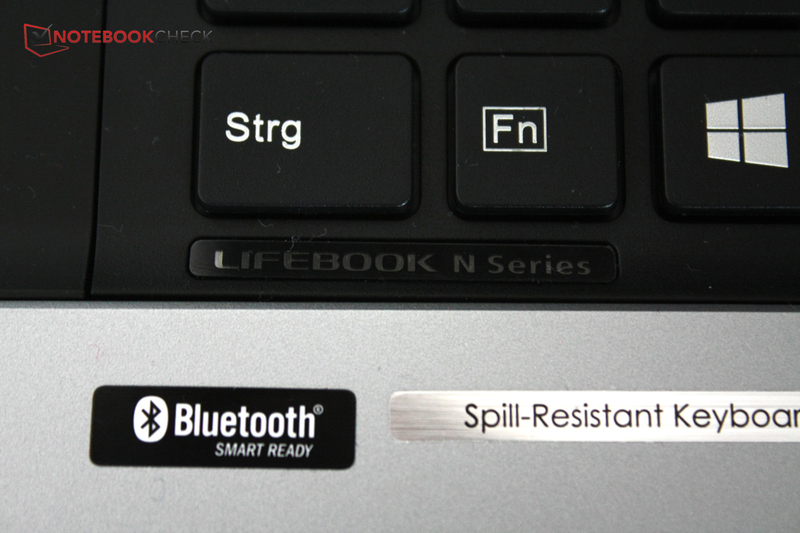 In this case you will be in good hands with the Lifebook N532. The chassis is completely made out of plastic but with its matte looks and pleasant haptics it makes a high quality impression. The transitions between the different parts are also very precise and have no perceptible edges. 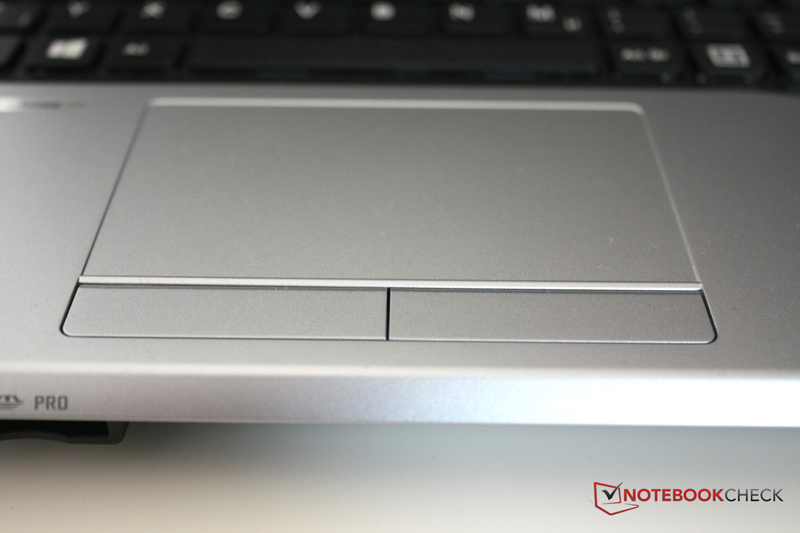 There is not much criticism with the stability of the notebook: The bottom can hardly be bent and the keyboard is surprisingly sturdy even above the DVD burner. This is a weak point for many other notebooks. Only the display can be bent a bit too much for our taste, which is also indicated by brightness distortions on the display. The pressure resistance of the cover from behind is not very good either. The design is best described as inconspicuous; Fujitsu made no experiments and chose a simple design that will not scare off anybody. Silver-gray and black dominate and will neither stand out in the office nor at home. That is how it should be for a notebook that wants to be an all-rounder. The Fujitsu Lifebook N532 is generous when it comes to ports and offers no less than three USB 3.0 ports, all located on the left side pretty far at the front. The single USB port on the right side is combined with the eSATA port and is also at the front so mouse users will have to live with the cable at the space where the mouse will be used. 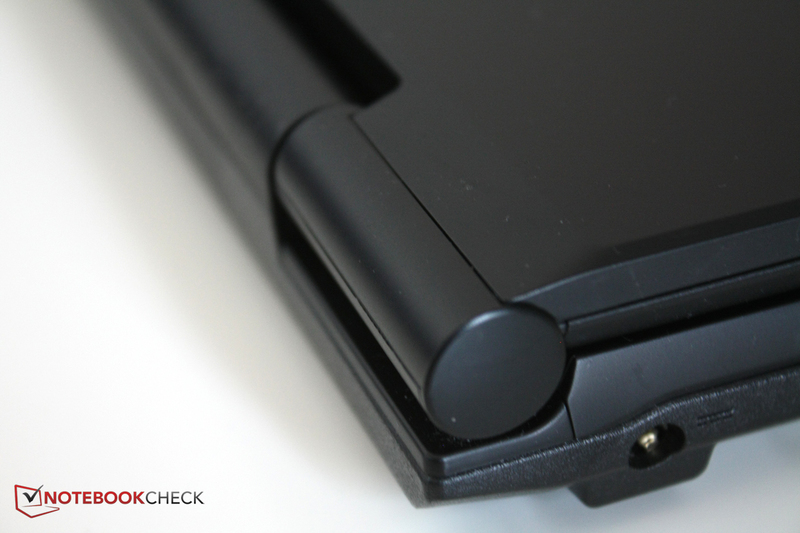 Otherwise, Fujitsu emphasizes the business orientation with the ExpressCard slot. 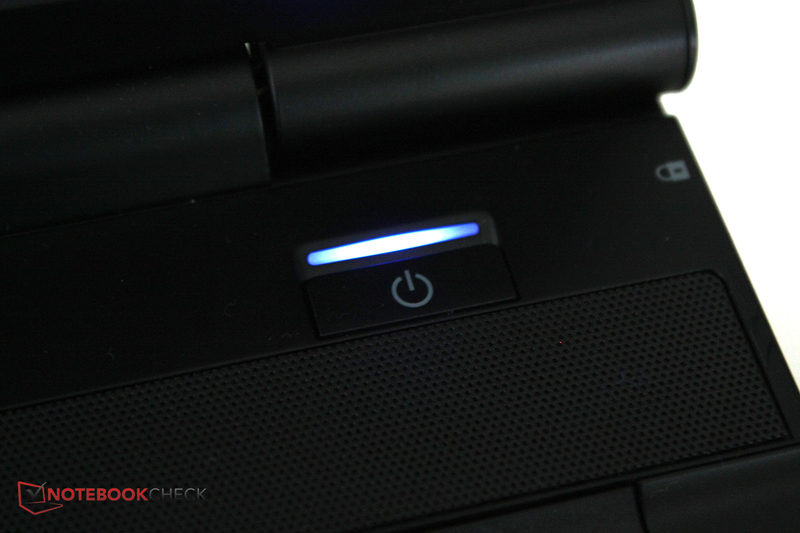 The common fingerprint reader is not offered by the Lifebook N532, in this case the HP Envy dv7, for example, has the advantage, as well as having a smart card reader. Gigabit-LAN is available for wired networks so even fiber optic lines can be pushed to the limits. Two antennas, both of which can receive and transmit simultaneously (2x2) are provided by the Intel WLAN module and can reach a theoretical transmission rate of up to 300 Mbit/sec. Communication via Bluetooth with the latest and most frugal standard 4.0 is also possible. A SIM card tray is hidden behind the battery. However, our review unit has no integrated WWAN module, Fujitsu offers the Sierra Wireless Gobi 3000 as an optional extra. 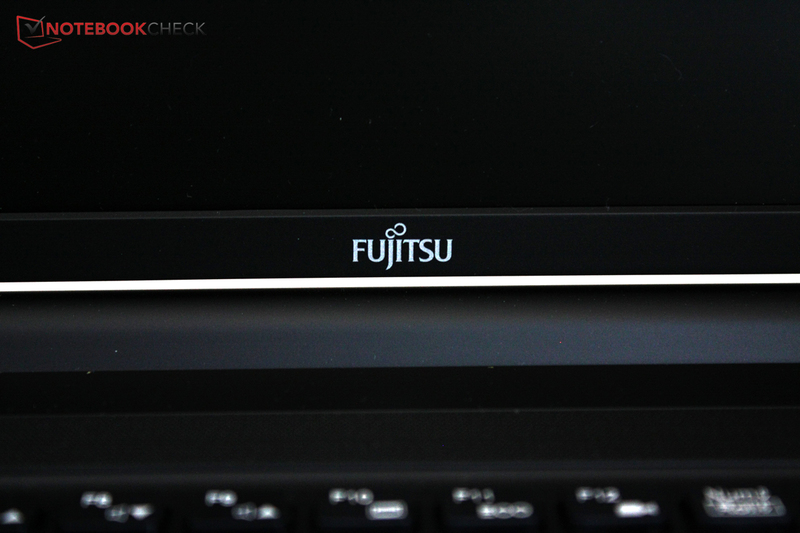 As mentioned before the Fujitsu Lifebook neither has an integrated fingerprint reader nor a smart card reader that users could use for identification. 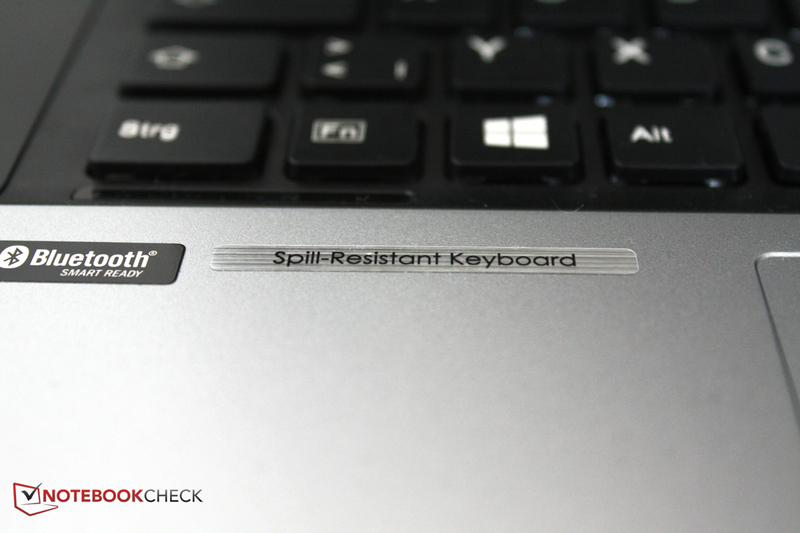 At least Fujitsu protects sensitive components against small amounts of liquids with the spill water resistant keyboard. 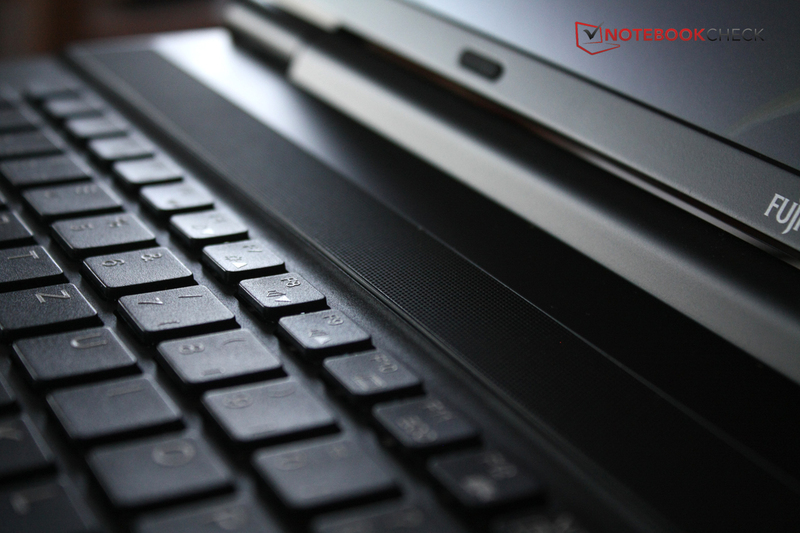 The BIOS is capable of Computrace, the notebook can be maintained, traced and secured remotely. A second hard drive can add data security via RAID but is not installed in our review unit. The preinstalled Norton applications are also for security but only limited trial versions. The TPM module is optional too and enables remote maintenance for administrators, even if the operating system is put out of action by a virus, for example. All in all, the Fujitsu offers some optional security features but in the base configuration of our review unit the protection is very limited. The pretty big box only contains the power supply unit, a quick start guide and recovery DVDs as well as driver DVDs. Good: The manufacturer gives the customer the choice to either use the installed Windows 8 Pro or switch to Windows 7 Professional. Both operating systems are available in the 32-bit and 64-bit versions. On its website Fujitsu offers some accessories like privacy filters, wireless mice or port replicators. We will have a closer look at the latter because it was available to us as well. The port replicator PR08 extends the port variety of the system via USB 3.0. The real highlights are the DisplayPort and the DVI port; all the other ports are already provided by the Fujitsu Lifebook N532 and are just multiplied. The practical thing about a port replicator is the connection of multiple devices, to take the notebook along you just have to detach one single cable. With its nice and slim design the PR08 is also an eye-catcher on the desk. The connection to the notebook worked flawlessly, the port replicator was recognized instantaneously. The port replicator can be bought online for around 170 Euros (~$220). 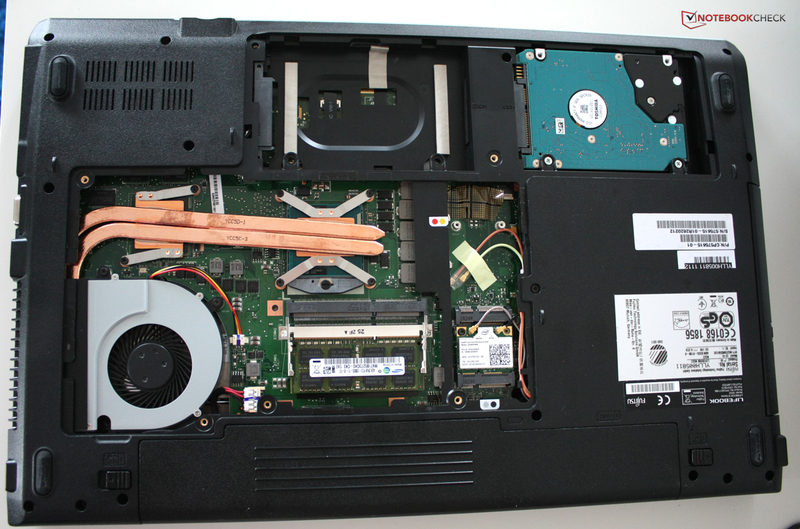 Maintainability is one of the strengths of the Fujitsu Lifebook N532: Just loosen one screw and you can access the RAM slots behind a cover at the back to install a second RAM module, for example. After loosening six screws you can lift almost the whole bottom and gain access to both hard drive bays and even the cooler, CPU, graphics card and most of the motherboard. A complete removal of the back is also possible; however, you will need a special screwdriver. Fujitsu only offers one year warranty out of the box, yet this does not apply for private buyers: They have two years warranty by law. 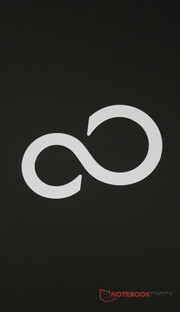 In the Fujitsu online shop you can extend the warranty to three years. Depending on the service, either bring-in or on-site, the package is 24.50 Euros (~$31) or 103.90 Euros (~$134) respectively. We consider the first offer very fair, the second one is a bit expensive. We already mentioned that the keyboard integration into the chassis is very solid. This results in hardly any flexing even under high pressure. 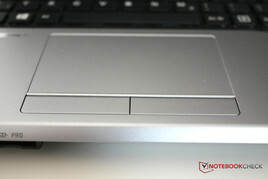 The stability is identical for the whole surface including the numeric keypad above the DVD burner. 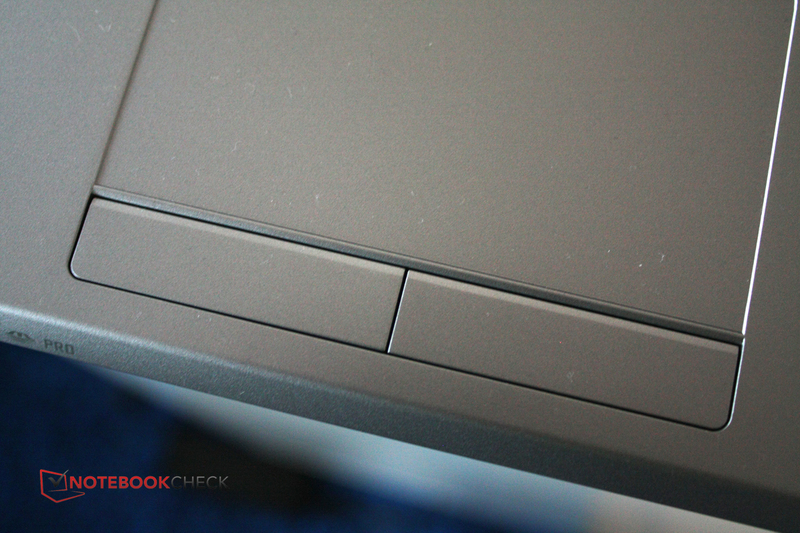 Many notebooks show stability problems in this area but the Fujitsu Lifebook N532 does not flex here at all. Typing on the normal sized keys (width of 1.2 cm) is quite good. Small travel and the well-adjusted resistance contribute to that. 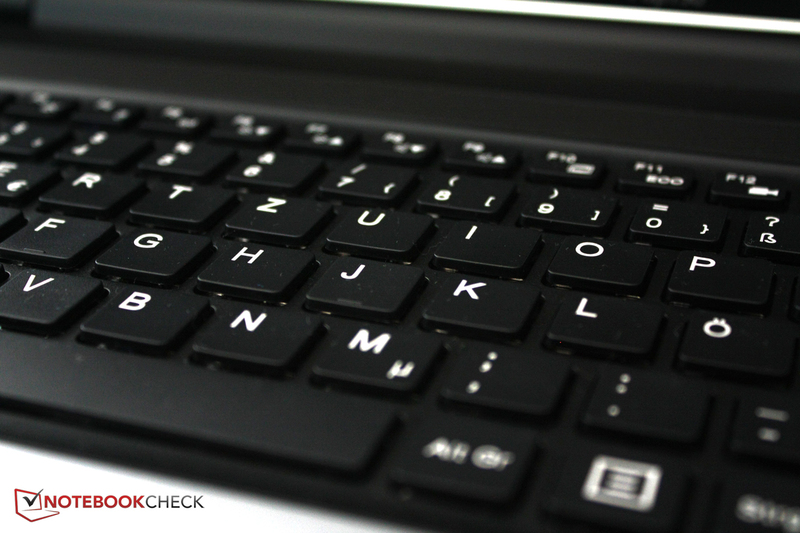 The generous spacing of 3 millimeters between the keys also helps to hit the correct key. The layout is slightly confusing because the "Break" and "Del" key are swapped. Special keys, for example for volume control, do not exist. 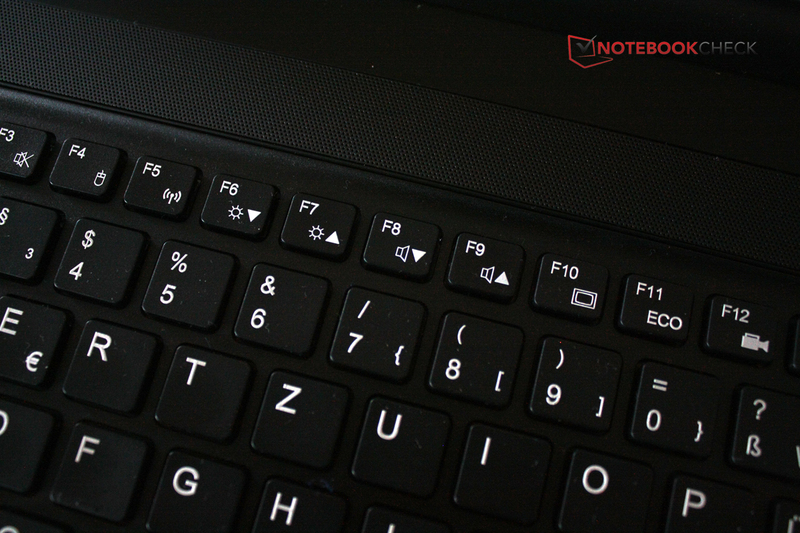 These functions can be used with the help of the function keys "F1" to "F12". The touchpad is also generously sized with a diagonal of 11.7 centimeters. It is slightly shifted to the left side of the chassis so the numeric keypad and arrow keys can occupy more space. 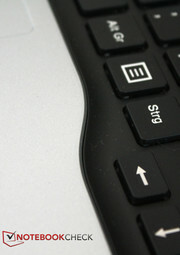 The surface is identical to the palm rest and offers pleasant haptics and good gliding capabilities. The finger is only slowed down by the surface when you apply too much pressure. Recognition of multitouch gestures is very reliable. The buttons make a very solid impression, give a good feedback, have short travel and also work reliably. However they are very loud, which might not appeal to everyone. A matte screen is not the highest priority of a 17.3-inch device like the Lifebook N532 since it is not very mobile anyway and will not be used outdoors very often. Nevertheless it is a benefit that Fujitsu integrates a matte panel provided by Samsung. It uses TN-LED technology, which usually offers smaller viewing angles compared to superior IPS panels. At a first look the performance of the display is satisfying: Crisp colors and a convenient maximum brightness convince us. 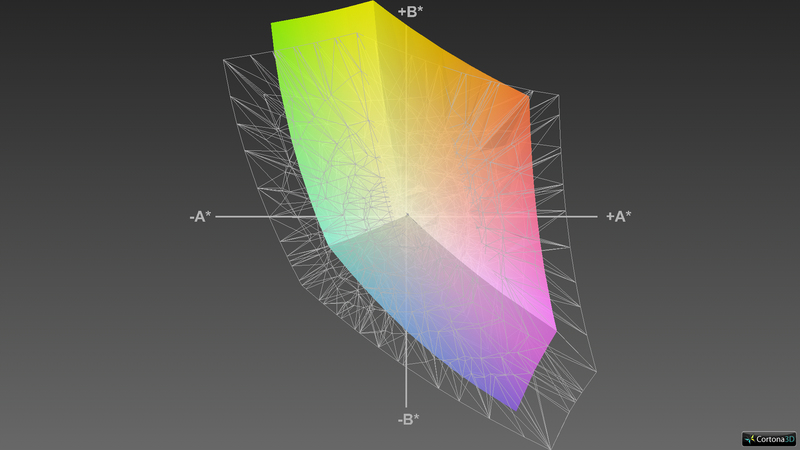 The measured values support this impression to a certain degree: Compared to other notebooks the display is quite bright, has a decent contrast and homogenous brightness distribution. 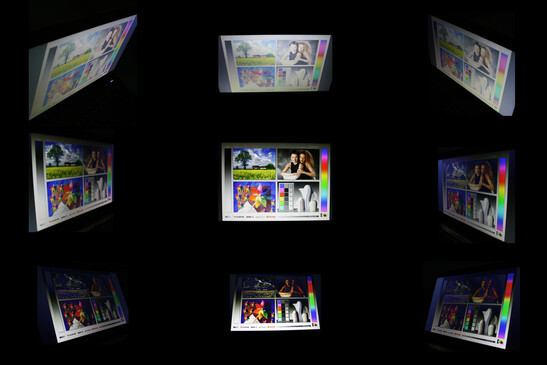 The HP ProBook 4740s and Asus K75VJ can almost keep up but are slightly behind with a 10 nits lower average brightness. However, the HP Envy dv7 has a noticeably better display. All in all, the measured values are midrange. 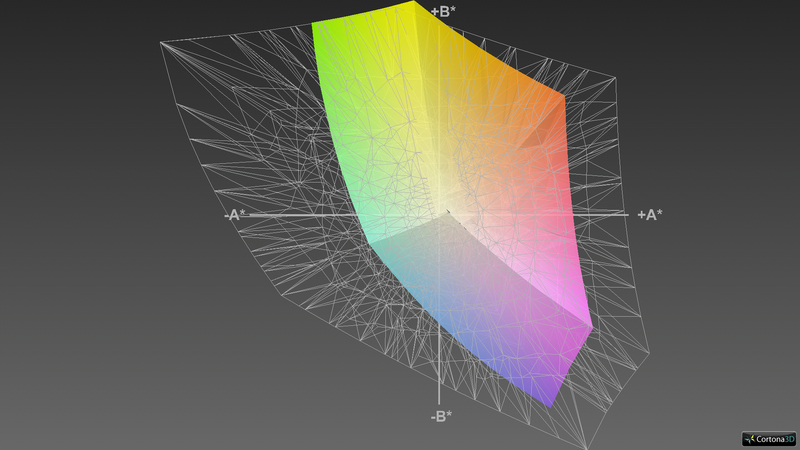 Compared to reference color spaces the display shows distinct weaknesses: While the HP Envy dv7 or HP ProBook 4740 cover most of the sRGB color spectrum, the Fujitsu Lifebook N532 cannot keep up and only delivers good performance with the yellow colors. Fortunately the typical user will hardly notice this: The coverage of color spaces is mainly important for professional users. Outdoors you will not see very much on the display, the maximum available brightness is just insufficient. In the shade or in a bright office you will not have any problems, since the matte screen minimizes annoying reflections. Even with small head movements to the left or right it becomes evident that the panel does not offer good viewing angles: Little movements result in noticeable contrast shifts. Upwards and downwards this phenomenon is even more distinct compared to the sides. When multiple persons are looking at the screen they should sit next to each other. A positive aspect is the opening angle of the display and the two hinges of almost 180 degrees, so the display can easily be adjusted for the perfect viewing angle. 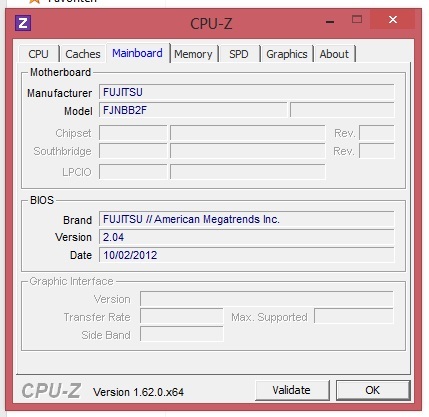 As mentioned before there are numerous hardware configurations for the Fujitsu Lifebook N532: Starting with an Intel Core i3-2328M up to a Core i7-3630QM almost every processor from the Core-i series is available. Also relevant for the performance: The hard drive. Here you can configure RAID systems or select Solid State Drives. Up to 16 GB memory can be integrated. 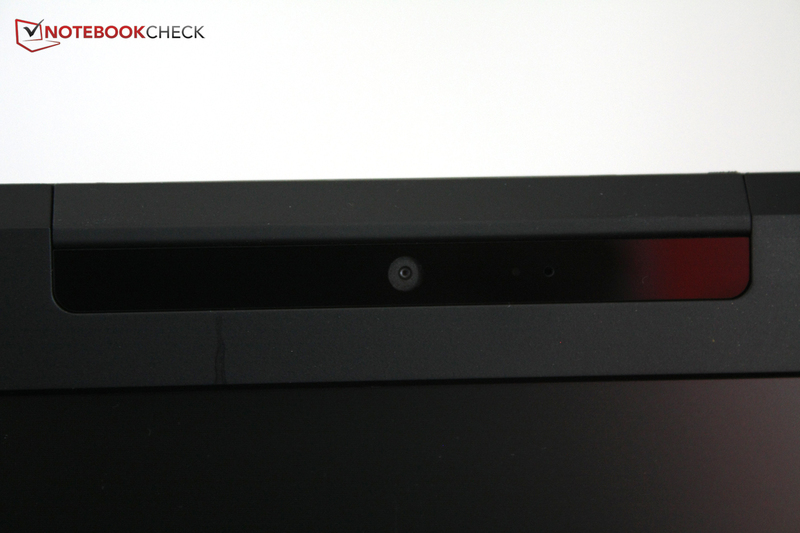 Only the Nvidia GeForce GT620M graphics cannot be changed, it is a low midrange solution, which is usually used in 14-inch devices, for example in the Lenovo ThinkPad Edge S430. Our system is equipped with a Core i5-3210M, a 500 GB hard drive and 4 GB RAM, which is lower midrange if you consider the available configurations. Overall our system should be sufficient for office tasks but there are not many performance reserves if the tasks become more demanding. The system is not powerful enough for 3D-calculations, video editing, etc. The processor is the most powerful component in our review unit. 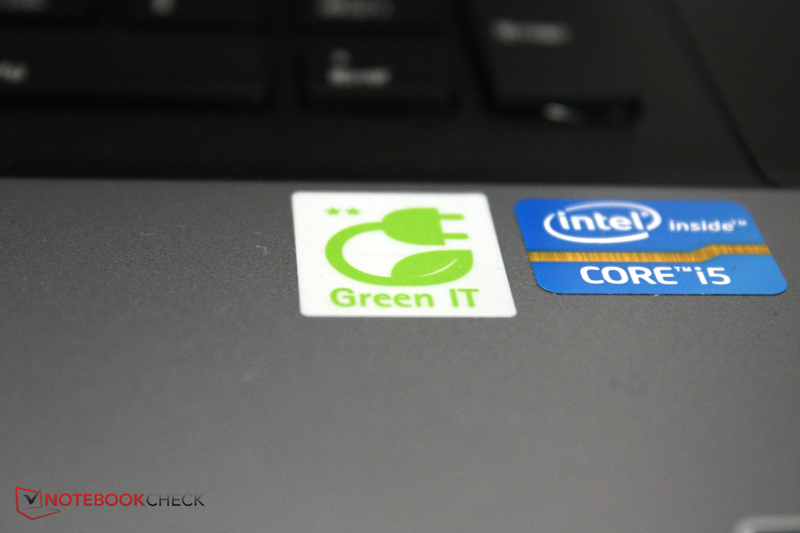 With its two cores that can execute up to four threads simultaneously and a nominal clock of 2.5 GHz the Intel Core i5-3210M is adequate for most tasks. The system can also dynamically adjust the clock via Turbo Boost and raise it to 3.1 GHz for one core or 2.9 GHz for two cores. In the synthetic benchmarks our system gets similar results compared to devices with the same processor. 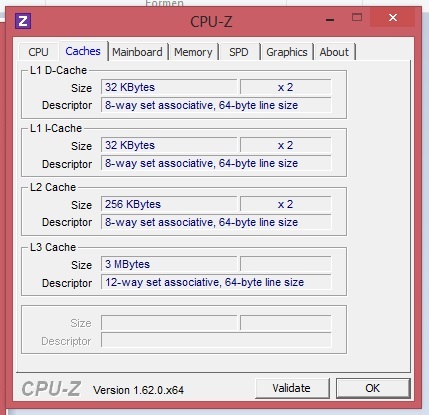 Throttling, a reduced clock of the processor, for example due to insufficient cooling, should not be a problem. In fact we saw the full Turbo clock in a short test; it is also not reduced during battery use as long as the profile "Maximum Performance" is selected. Even if our system does not have the high end components, the system performance indicated by PCMark 7 is similar to comparable devices. 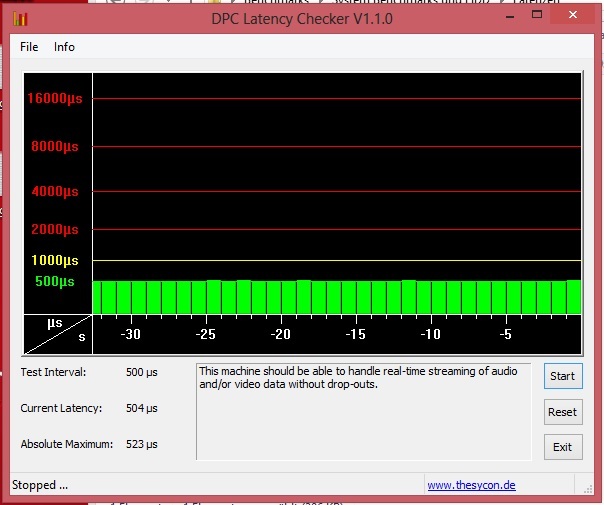 Unfortunately PCMark Vantage does not work with Windows 8 so we have no test results for this benchmark. All in all, the Fujitsu Lifebook N532 is even ahead of the competitor HP ProBook 4740s. The components seem to work well together and result in a low midrange system. No component slows the system down noticeably. The Lifebook N532 has sufficient performance for daily tasks but there could be problems with more demanding applications. The Toshiba hard drive with a capacity of 500 GB is not really the fastest: It only works at 5,400 revolutions per minute. Both the HDTune benchmark as well as the Crystal Disk Mark results are clearly lower than competitive devices with similar hard drives. However, this is not noticeable during practical use, applications and the operating system boot quickly. 15 GB of the hard drive is used by the recovery partition that contains a system image. This is redundant because the notebook is delivered with recovery DVDs, so you can delete this partition if necessary and use the additional space. Usually the Nvidia GeForce GT620M can be found in considerably smaller devices and so far we did not review a 17.3-inch device with this graphics card. It is a low midrange solution with a clock of 475 MHz and 1,024 MB dedicated memory. Via Nvidia-Optimus technology the graphics card can be deactivated for low demanding tasks and then the Intel HD Graphics 4000, which is integrated into the processor, can be used instead. The user can also step in and choose the graphics for each application. The graphics card gets solid results in the benchmarks that are partly much higher than competitors with the same graphics (compare Lenovo ThinkPad Edge S430). These devices often had a version with reduced clocks to avoid critical temperatures. This is not necessary with the Lifebook N532 and it is also not a problem, even with battery use and continuous load the graphics card does not reduce its clock. However, the same graphics in the Acer Aspire E1-571G has a significantly higher clock with 625 MHz. The gaming benchmarks will show if there is an impact on the performance. Gaming should be possible with the GeForce GT620M graphics, yet it will not be sufficient for the native display resolution and high details in many games. The reduced clock is another factor. In fact our review unit performs worse in all games compared to competitors with the same graphics but higher clocks. For better comparison we tested the same games that we used in the Acer Aspire E1-571G review. 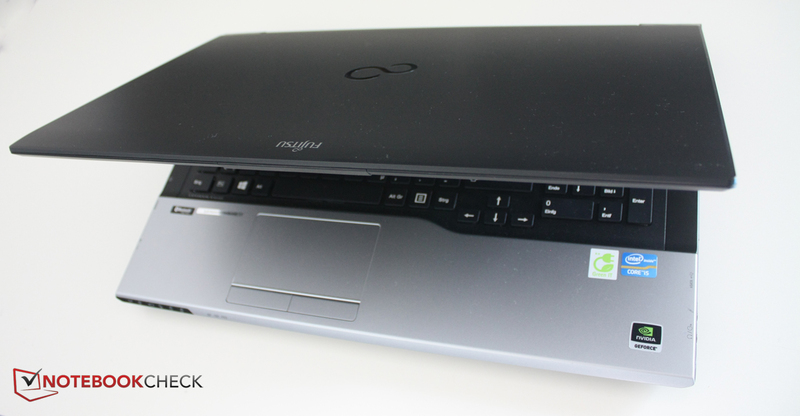 We can see a 20% performance disadvantage of the Lifebook N532 because of the reduced clock. And the competition? The HP ProBook 4740s is on the same level and the Asus K75VJ is far ahead in many games thanks to the more powerful GPU (GeForce GT 635M). Overall most of the latest games are playable on the Fujitsu Lifebook N532 with reduced details and a reduced resolution. However, it is not really future-proof, so if you want to play browser or casual games in the future you should consider a more powerful device. 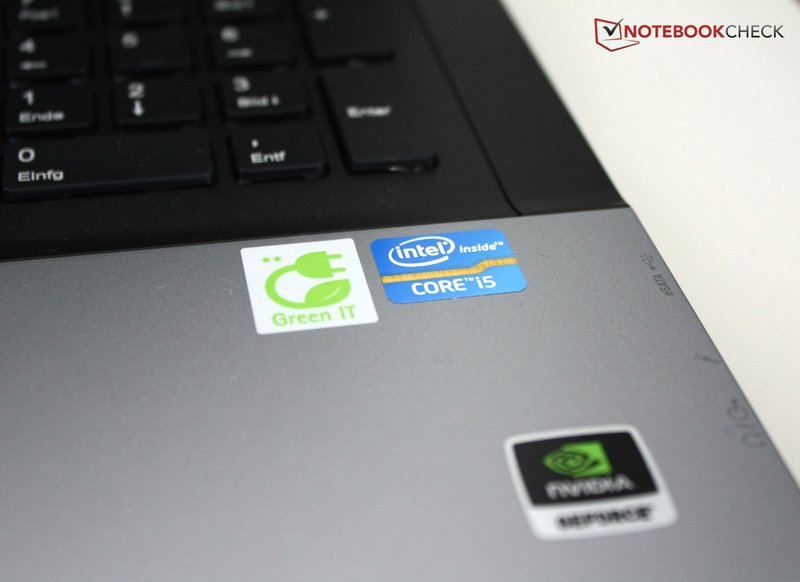 Both the Intel Core i5-3210M and GeForce GT620M have proven to be very easy to cool, especially in a 17.3-inch chassis like the Lifebook N532. It is not surprising that the fan is even completely deactivated from time to time and the HDD is the only audible part during idle. We measure 33.3 dB when there is absolutely no load, this hardly changes during idle. With maximum load we measure a maximum value of 42.3 dB. This is audible but not annoying. During movie playback via DVD burner you have to live with 36.4 dB. Still audible but it should not interrupt the cinematic enjoyment. 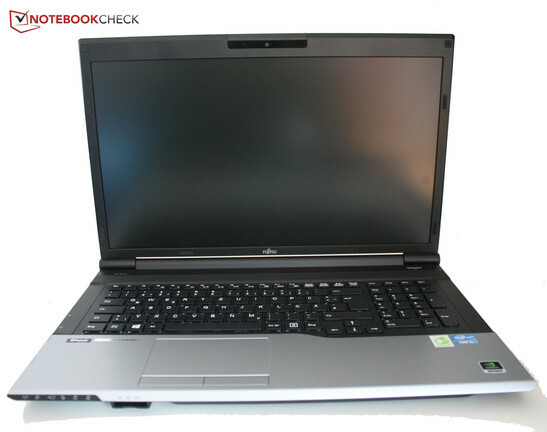 All in all, the system noise of the Fujitsu Lifebook N532 is similar to most competitors, for example the HP ProBook 4740s. When the fan is spinning it is very quiet. Does this result in higher surface temperatures? Not at all: The absolute maximum is just 37.3 °C at the left back side of the bottom. The warming can be felt but the notebook can be used on the lap without any problems. 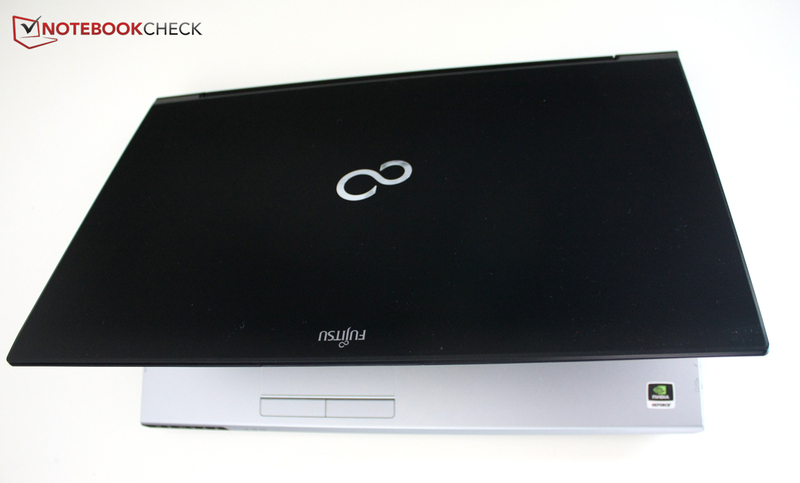 Especially with little load the maximum temperature of the Fujitsu Lifebook N532 is only 33.6 °C at the rear left. Only at one spot the frugal cooling becomes evident: The palm rest is about 20% warmer during idle compared to maximum load. That is because the fan transports more heat from the case during maximum load. But even during idle the temperature of the palm rest is never unpleasant. The speakers are located above the keyboard behind a grid over the entire width. 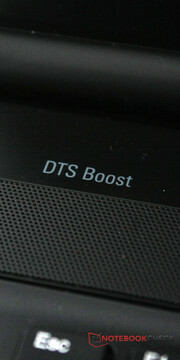 The two speakers have the DTS license, which usually takes care of good cinema sound. Sounds promising, right? Unfortunately the speakers cannot keep the promise that comes with the "DTS Boost" symbol: Although the high and mid tones are okay, the deep tones are completely missing. This results in an empty sound from the speakers, which is not very enjoyable. At least the maximum volume is convincing but without bass nobody wants to listen to that. The speakers are well suited for video chats; for music playback or movies you should use the stereo jack: Attached headphones or speakers deliver a good sound. The maximum energy consumption is within the norm with 70.6 Watts, unfortunately we have no comparative data from other 17.3-inch notebooks since the GeForce GT620M is usually only used in smaller systems. All in all, the Lifebook N532 is in the middle of the competition when it comes to energy consumption, so we can rule out an exceptional high or low consumption. With minimal use the notebook consumes at least 9.5 Watts. Activated WLAN and the "Maximum Performance" energy profile raises this minimal consumption up to 15 Watts. These values are also within the norm. 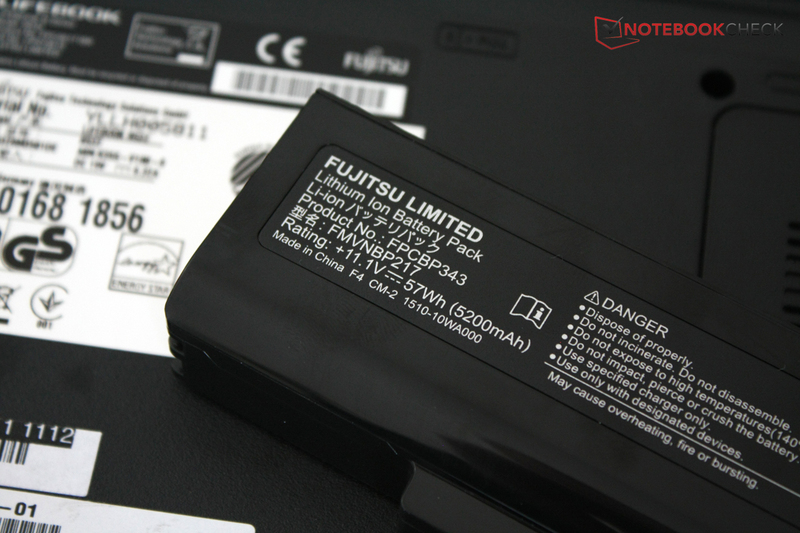 On its website Fujitsu advertises the epeat-Gold label and the Green-IT label for the Lifebook N532 so the notebook has to meet certain consumption requirements. In one point the notebook is very green: Turned off as well as in standby it pulls 0.0 Watts from the socket. For how long does the battery at the back keep up with these consumption values? Let us clear up the basic data first: Fujitsu uses a lithium-ion battery with 57 Wh, so it is smaller than the competition. With little load the Fujitsu Lifebook N532 runs for up to 5:20 hours. This is not the promised seven hours by Fujitsu but this scenario is not really realistic anyway. Surfing via WLAN or watching a DVD are more realistic - then the runtime is 4:02 hours and 3:33 hours respectively before the battery has to be recharged. With maximum load it runs out of juice little after an hour. So how about the competition? 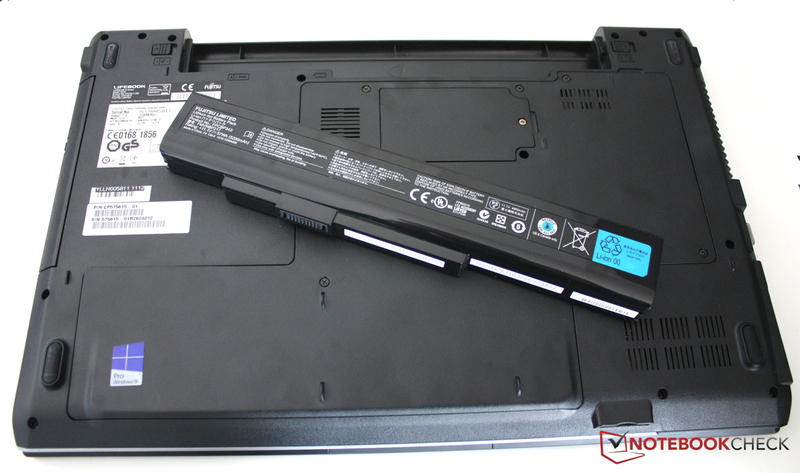 The HP ProBook 4740s is actually ahead when it comes to runtimes thanks to its larger battery (WLAN runtime: 4:38), the HP Envy dv7 with its more power-hungry components is beaten despite the larger battery (WLAN runtime: 3:03). 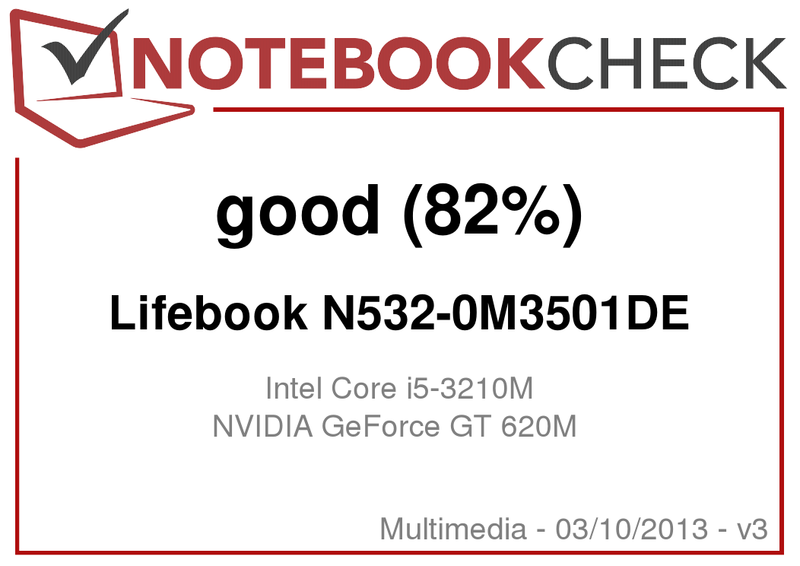 The runtimes of the Lifebook 532 are between the competition and therefore good average. 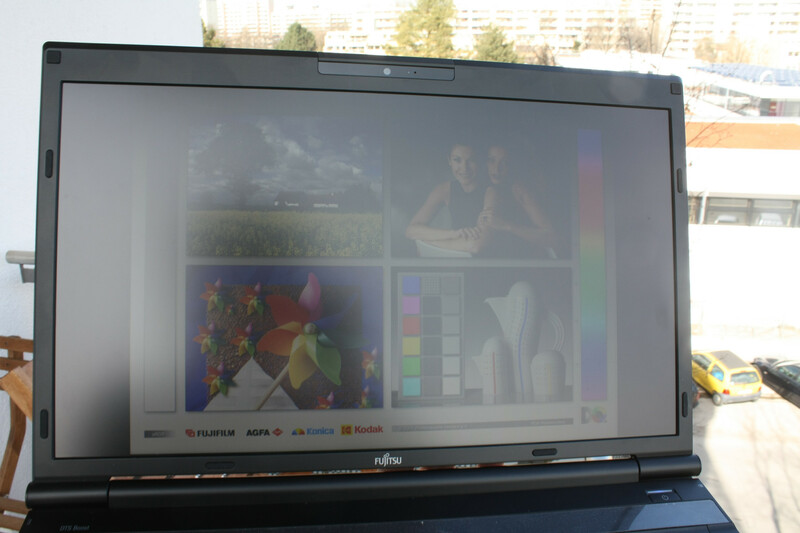 The Fujitsu Lifebook N532 wants to please everybody and be a notebook for business customers as well as multimedia users. So does it sit between the chairs? Yes, in many areas this device is just too average. The display is okay but nothing that would impress movie enthusiasts or gamers. Many security features can be upgraded but overall the available security features will not be sufficient for business customers. The graphics card is basically capable of gaming but notebooks with better GPUs often cost the same or even less. 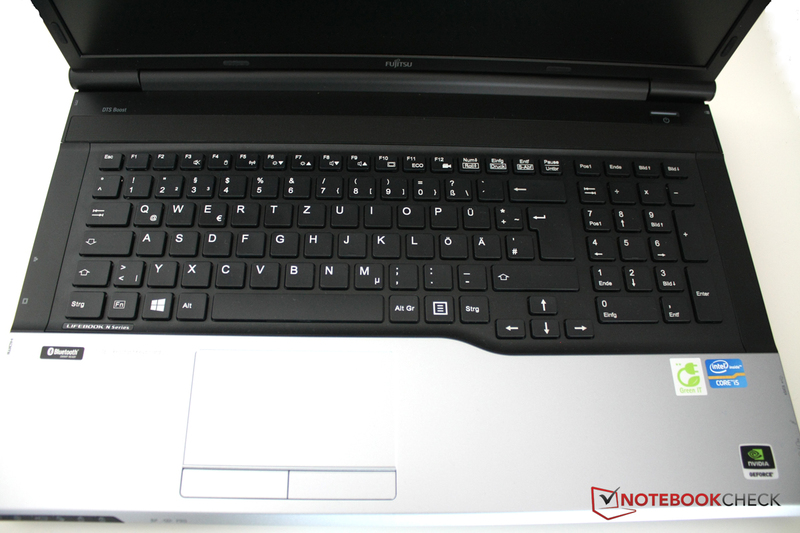 We liked the solid build quality and the very good input devices of the Fujitsu Lifebook N532. Does that justify a purchase? During the review we often wished Fujitsu would have been more courageous and would have either made a distinct office or a consumer device. Now the Lifebook N532 offers a bit for everybody and does not make any big mistakes, but it cannot inspire either. If you are looking for a basic 17.3-inch notebook and your demands are not too high, you can give the Fujitsu Lifebook N532 a chance, everybody else should consider more specialized products. 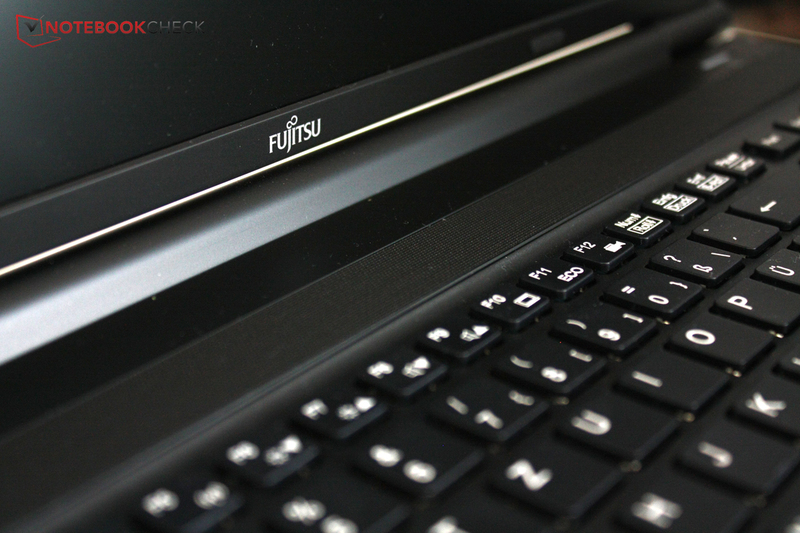 Fujitsu wants to offer an all-rounder with the Lifebook N532. ... and a separate numeric keypad. Both buttons work perfectly but are a bit noisy. The device has a Green-IT-Label as well as the epeat-Gold-Status. The power button shines in a nice blue. ... and enables decent runtimes. ... they sound pretty bad. ... as well as a low resolution webcam. Convenient: The ports are labeled on top. 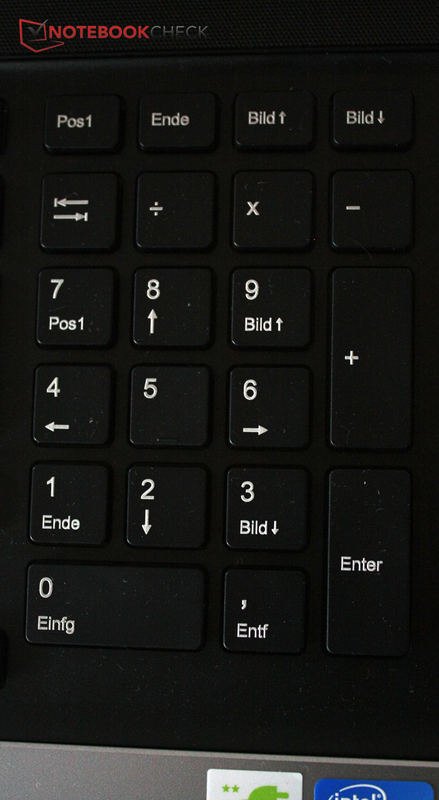 The special keys are connected to the function keys "F1" to "F12". The graphics card from Nvidia is very low clocked. The notebook is targeted at business as well as multimedia user. The 17.3-inch notebook has a simple yet stylish design. Even the hinges look good. The bend in the palm rest looks good and results in more space for the keyboard. The side is not so pretty, at least it has many ports. Plastic is the material of choice. The solid build quality of the chassis results in a high quality impression. The keyboard is also well integrated into the chassis and does not flex. The operating system is Windows 8 Pro. Easy access to the RAM: Just loosen one screw. 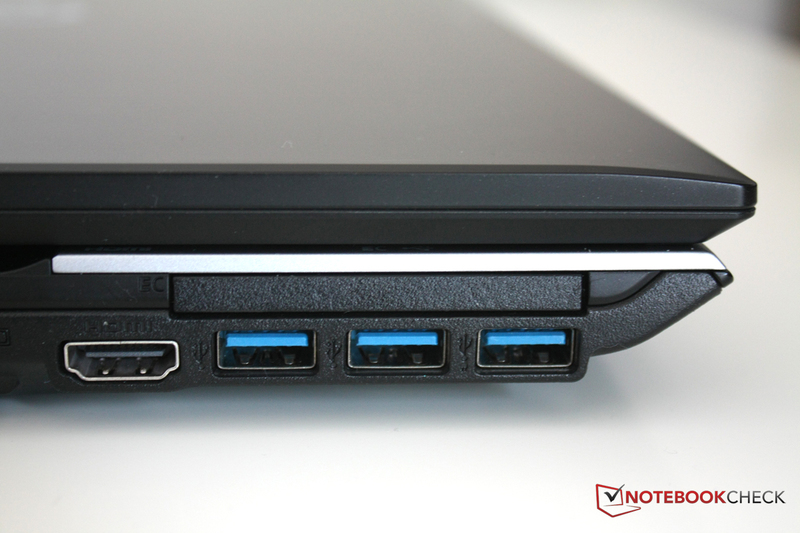 Three USB 3.0 ports are on the left side. Numerous status LEDs indicate what happens with the system. The card reader is also at the front. 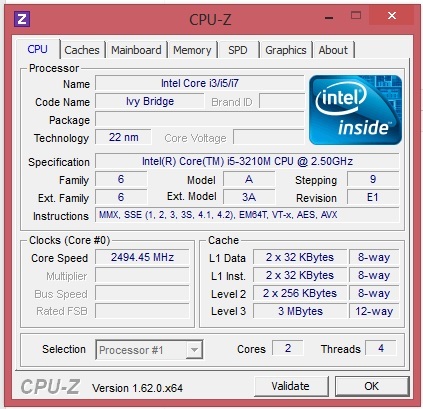 The processor is provided by Intel. 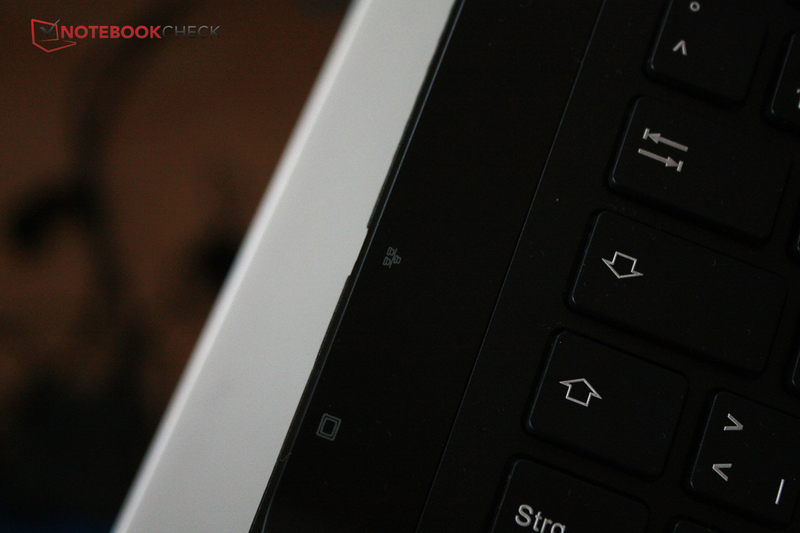 "Fn+F4" activates or deactivates the touchpad. An automated recognition of a mouse is also possible. The solid chassis and the very good input devices. A higher clocked version of the graphics card. How little the notebook does wrong, yet does not inspire us at all. 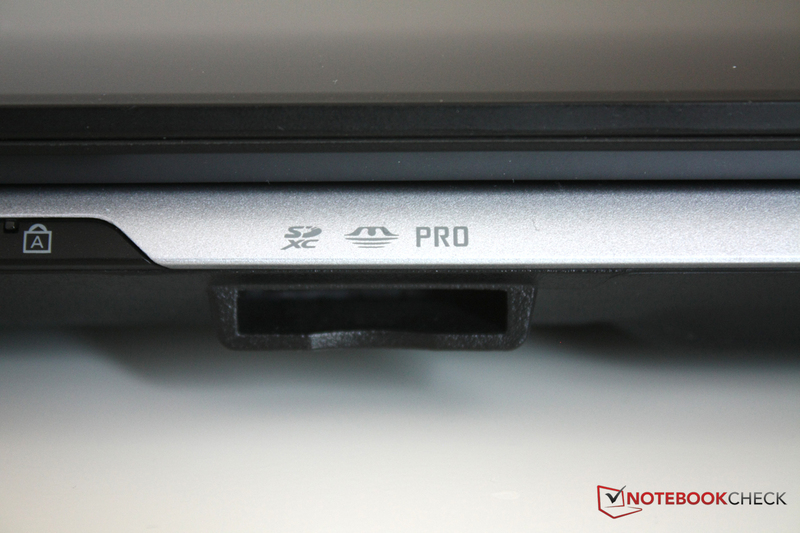 HP ProBook 4740s, HP Envy dv7, Asus K75VJ, Toshiba Satellite L875D-10E, Lenovo G780.